Either Astra Sharma or Amanda Anisimova will win her first WTA Tour title Sunday after the pair advanced to the final with wins Saturday at the Claro Open Colsanitas in Bogota Colombia. The 17-year-old Anisimova will be playing in her second WTA tour final, having lost in the final of the Hiroshima Japan International last September. She defeated qualifier Beatriz Haddad Maia of Brazil 4-6, 7-6(2), 6-2 in over two-and-a-half hours. The 23-year-old Sharma, who was playing No. 1 for Vanderbilt last year at this time, had never reached the quarterfinals of a WTA event until this week, but the Australian was able to eliminate 2012 champion and 2017 and 2018 finalist Lara Arruabarrena 7-5, 6-1 in just over an hour. With her run this week, Sharma is now on the cusp of the WTA Top 100 and the main draw of the French Open. For more on Sharma's win today, see this article from the WTA website. Sharma has already earned her first WTA title, regardless of the outcome of tomorrow's singles final. She and Zoe Hives, also of Australia, beat Hayley Carter(UNC) and Ena Shibahara(UCLA) 6-1, 6-2 in the Bogota doubles final. 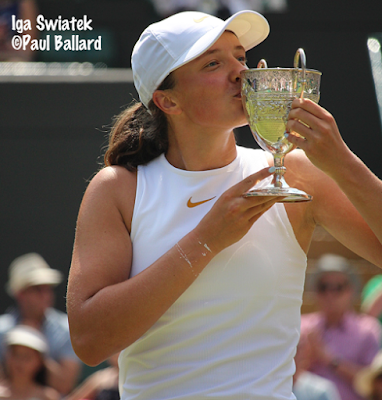 Current girls Wimbledon champion Iga Swiatek of Poland has advanced to her first WTA final, with the 17-year-old beating another Wimbledon junior champion, Kristyna Pliskova of the Czech Republic, 6-0, 6-1 in less than an hour in today's Samsung Open in Lugano Switzerland. Swiatek will face unseeded Polona Hercog of Slovenia, who beat unseeded Fiona Ferro of France 7-5, 6-4 in the other semifinal. Swiatek will break into the WTA Top 100 regardless of Sunday's result. Exactly a year ago, Swiatek was winning the $25,000 USTA Pro Circuit event in Pelham Alabama. Tomorrow, the final at that tournament will feature No. 2 seed Caroline Dolehide and No. 7 seed Barbora Krejcikova of the Czech Republic. Dolehide defeated No. 4 seed Sesil Karatantcheva of Bulgaria 6-3, 7-6(4) while Krejcikova, last week's champion of the $80,000 tournament in Palm Harbor Florida, beat qualifier Hailey Baptiste 3-6, 6-3, 6-4. Dolehide already has earned one title this week, taking the doubles championship today with Usue Arconada. The No. 3 seeds defeated the unseeded Romanian team of Oana Simion and Gabriela Talaba(Texas Tech) 6-3, 6-0 in today's final. Two American men will play for ITF World Tennis Tour $15K titles Sunday, with No. 8 seed Sebastian Korda playing Dmitry Popko of Kazakhstan in the Sunrise Florida final, and Jordi Arconada facing No. 5 seed and former Duke star Nicolas Alvarez of Peru in the Cancun Mexico final. Korda defeated No. 2 seed Alejandro Gonzalez of Colombia 3-6, 6-2, 6-1 in today's Sunrise semifinal, while Arconada, a former Texas A&M star, beat No. 8 seed Lorenzo Frigerio of Italy 6-4, 6-3 in the Cancun semifinal. Both the 18-year-old Korda and the 22-year-old Arconada are looking for their first singles titles on the ITF World Tennis Tour. The doubles title in Cancun went to No. 4 seeds Henry Craig(Denver) and Julian Bradley(North Florida) of Ireland, who beat Ecuador's Ivan Endara and Peru's Jorge Panta 6-3, 6-3 in the final. No. 2 seeds Justin Butsch(LSU) and Alexander Ritschard(Virginia) won the Sunrise doubles title, beating Argentina's Maximiliano Estevez and Chile's Bastian Malla 3-6, 6-3, 10-2. It's Butsch's third ITF WTT doubles title and the first for Ritschard.